To lead a life, we need a society. To build a society, we need to carefully structure the dynamic elements in it. One of such elements is “progeny” and the other is “coexistence of a group of people” in a society. Progeny propagates the quantity of the social beings while the coexistence ensures their sustenance (of different groups). Among different groups viz., friends, relatives, casts, sects, genders, etc., the bond of a “Husband-Wife-Child(ren)” forms a basic foundation brick for a social-triangle. Without this triangle, a society does not exist and without a society our race will be extinct, for, we are “social beings”! “Marriage” is one instrument which brings and holds this triangle together and each stable triangle makes the polygonal society firm! Ancients considered certain acts of life as rituals. A ritual is that which enacts the dramas of creation and gives a stir or an impetus to the individual consciousness so as to orient it towards a path of life which resonates with the plan of nature. But most of ancient rituals exist in the hands of those masters who silently observe and guide the humanity, and hence, are not well known to the common public yet. But, some rituals like “MARRIAGE” are known to everyone. Almost all cultures and civilizations considered the marriage as a ritual rather than a function or an event. Among many ancient civilizations, Hindu culture still retains its Vēdic roots which go back to even more than 5000 years. In this article, we will explore the ritual of a Hindu marriage emphasizing on some main elements. This is a broad overview and hence should be seen as a bird’s eye view. Every sect will have their own customs added or deleted to this overview. The aim here is to explore the heart of the ritual than the particulars of the ritual. All most all Hindus follow most of the following elements in their marriage ritual. But, I am sure that not many know what and why they are doing it. They just ape the instructions of the priest and look forward for a social gathering event for fun. But the elements of ritual, if followed without a knowledge of the essence will be a futile act and a time waste. This is the reason why, I explored and learnt (at least some) the meaning of the elements of our marriage and hence, I wanted to write an article that would help others with similar thirst. Rakṣābaṇdhanaṃ: Tying of a protective thread around the wrist of bride and groom which will be removed on fourth day from the start of marriage. So, one-third of the elements include only groom while the other one-third includes bride’s father and the bride. The rest of them include both the bride and groom. Basically the elements mimic the ancient lifestyle and hence are to be seen only as a un-cut thread of continuity of an ancient thought with a proper transfer of heart of meaning of marriage. The present day modern mind may see these rituals in as many ways of deteriorated view as possible. The lens from which they see is what makes them see what they see! 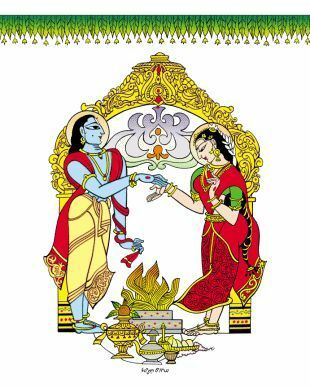 A pure heart and a clean mind are required to squeeze the gist and essence of an ancient thought from the many facet fruit of present day marriage ritual of a Hindu. I hope you, the truth seeker, will throw away any ideas that cause discomfort in your mind and take in only that which suits your temperament, from these articles, for , in my view, I feel what I am expounding is all WHITE and that is only for me and I can not ask everyone to see it the same way and hence this small hope! Can you elaborate and give some bullet points so that I can see if it fits in my aim to expound the meaning of acts of a marriage ritual that are performed by a couple and related families, and if not, I may write a separate article based on what you suggest . For example kanyadaan. How this ritual considers woman as a mere object or a property. Or marriage itself? How it is akin to exploitation? But that is not my view and hence I can not write in those lines. I read meaning of almost all mantras (for few days) uttered in marriage ritual and saw, on first hand basis, that no such notion exists. At least, I did not find any such view (I heard from friends but now I know that they too do not actually know what the ritual says/intends. May be they spoke based on what people do which is not ritual’s concern. A ritual exists to guide people. If people misunderstand/misinterprets and cause havoc, what can a sage/ritual do?!). In fact I was wonder stuck when I comprehensively understood the essence – with the wide open minds and pleasant hearts that the ancients had. A promise made by groom, as part of ritual, that “I will never behave exceeding you or exploiting you and will always share equal rights and duties with you” made me realize how advanced our ancients were. So, I can not write in the lines that you suggested! Another example (which will come in part-4) is that the choice is given to woman to choose what child she needs – boy or a girl or if SHE is not sure or not wants a child. Accordingly SHE is asked to held the four fingers/thumb/whole palm and utter the mantras. The scientific truth value of this act may be left to explorers. But if one wants to understand the ritual’s psychology, one will have to conclude that “Girl child(s)” were wanted by ancient people unlike recent past scenario and also that woman had the choice to choose. I hope you understand my reluctance to comment in the lines you suggested. It is not to deny bluntly what you stated, but just to humbly explain you that I am unable to view such a view after understanding what the ritual actually suggests – linking with spiritual elements (after all, spiritual and esoteric is the nature of any ritual of ancient order). “Dharmē/Arthē/Kāmē Twayā ēṣā nāticarvya” – DO NOT transcend (or cross or exploit ) my daughter in terms of Dharma/Artha/Kāma is spoken by bride’s father. and the reply by the groom is – “Nāticarāmi” – I vow to NOT to DO so. In theory, all that you said is very correct and I am sure seers who wrote all this had the best intention for womankind. But somehow, as with everything else, these rituals and diverse interpretations were being used to exploit and marginalize women. Moreover, all these rituals and shlokas were not written in local language so common men and women could not fully understand. And this is so true today as well. So, we are dependent on a few godmen/god women to interpret to us. I completely understand your reluctance to write from that angle. it was just a suggestion nothing else. Do write more, I will look forward to reading. So true. Why just woman, the whole human kind exploited itself in the name of god, religion, power, money, caste, gender, etc., in the recent past and the same is also true even now. The aim in writing blog is to voice the TRUTH and ignite those minds which are ready to change. My goal in this blog is to remove such mist from the minds of interpreters of ancient lore. The statement “in theory ….” is very true and yet disheartening. People need to shape for betterment. They need to respect the past and take guidance from seers just as a junior takes suggestions from a senior in terms of career. Yet each generation has its own st of creative ideas to flourish. Both needs to have balance. i find this so interesting. please continue this post.As a women in present times.I wonder what is uplifting to carry forward.thank you for this topic!